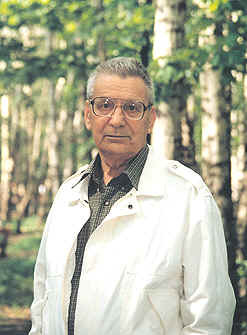 Vladimir Alexandrovich Marchenko was born on July 7, 1922, in Kharkov. His father, Alexander Grigoryevich, was from a family of serfs, but managed to become well-educated person. After graduating from the St-Petersburg Academy of Forestry, he left for a professional position and was directed to the Institute of Forestry in Lyublin guberniya. This institute was transferred to Kharkov during the first world war. When his youngest son Vladimir was born, A.G. Marchenko became a professor in the Agriculture Institute. The family already included three children: Irina, Dmitry and Sergey. The duties of housekeeping and upbringing of children in the family were carried out by Olga Fedorovna, a woman of wonderful kindness, probity and calm. She had received a state education in St-Petersburg and worked as a teacher before she married A.G. Marchenko. Olga Fedorovna knew how to inspire high moral principles, impeccable honesty and goodness to their children. Vladimir's oldest sister, Irina, was fascinated since childhood by poetry, music and languages; she graduated in Leningrad University and worked in the Kharkov Conservatory and later in Leningrad, being engaged in history of art. His brother Dmitry, after graduating from the Kharkov Civil Engineering Institute became a specialist of the construction of derricks and other oil structures during the last second world war; he first worked in Baku, then in Moscow, at the Ministry of Oil Industry, then at the USSR Gosplan. His other brother Sergey, after entering the Medicine Institute, was called for military service in 1939. At the beginning of the war with the Germans he was encircled; he escaped, was put in a Russian so called "check camp'' in 1943, and found himself in military service again. 'Senior lieutenant' Sergey Marchenko was killed at the end of 1944, during offensive operations in Pribaltika. Vladimir Alexandrovich's childhood was not exempt of hardships. In 1929 his father, together with some foresters was convicted for their attempts of obstruction to wild deforestation ("for the construction of socialism''). He was absent during three years, and died in 1940, not long after coming back home. But in spite of misfortunes, friendship and spirit of high culture always prevailed in the family. Mother's readings aloud were marked by special love. All children studied foreign languages, Dmitry learnt drawing, and Irina learnt music. Chemistry was nearly the favorite discipline for Vladimir in school, and its knowledge helped him to survive during the Second World War. After finishing the school, in 1939 Vladimir Marchenko entered the Department of Physics in Leningrad University. He began to study simultaneously Mechanics and Mathematics, and towards the summer of 1941 he had finished two courses at the Physics Department, and three at the Mechanics and Mathematics Department. When he came back to Kharkov in vacation time, the war had begun. He had not been called for military service because of strong short-sightedness. At that time the only members of the family staying at Kharkov were his mother and sister with her little daughter. They couldn't be evacuated from Kharkov, and the hard years of foreign occupation soon came. At first they survived by exchanging their belongings for provisions, but later Vladimir Alexandrovich began to earn a living in the match production. There was a great shortage of matches at that time, especially in the country. V. Marchenko handed over to a Kharkov match manufacturer a chemical technology he had developed on his own, and received in payment a container of chlorine. He could then use caustic soda and other ingredients, and organized his own salt and match "production''. Mother sold these products, and this activity helped the family to survive. When Kharkov was liberated in 1943, Vladimir Alexandrovich continued his studies and entered the 4-th course in the Mathematics Branch of the Physics and Mathematics Department of Kharkov University. Since that time all his professional life has been concentrated on mathematics. In 1945 he graduated from the university and began a post graduate course, which he finished ahead of schedule. V. Marchenko defended in January 1948 his candidate thesis "Summation methods for generalized Fourier series''. At that time there was the Scientific Research Institute of Mathematics at Kharkov University. Vladimir Alexandrovich was engaged in teaching at the university, and simultaneously worked as a research officer at Department of Mathematical Analysis till its closing in 1951. Under the influence of famous Kharkov mathematicians such as N.I. Akhieser and A.Ya. Povzner, Marchenko began to work on problems related to the Schroedinger differential operator, and at once obtained series of brilliant results. He had defended his doctoral thesis as early as 1951: "Some problems of the theory of one-dimensional linear second-order differential operators''. His name became famous among specialists working in this area. At the same time he continued his teaching activity in Kharkov University, where he became a 'dozent' in 1950, and a professor in the chair of Mathematical Physics in 1952. In 1960, thanks to the efforts of some physicists, and the support of P.L. Kapitsa, the Institute of Low Temperature Physics & Engineering (ILTPE) was founded in Kharkov. The main initiator of institute creation was professor B.I. Verkin, a man with a unique capacity as scientist-organizer. B.I. Verkin and V.A. Marchenko were friends and knew each other from childhood, although Verkin was a little older. In a discussion on the possible future institute's activities, the idea was born of creating a mathematical departments at the new institute. This idea was materialized and, however strange this may seem to many other scientists, the symbiosis of physical and mathematical research at the ILTPE has happily continued since, till today. Vladimir Alexandrovich was at the head of the Mathematical Physics Department in the ILTPE. Since that moment a new phase of life and scientific activity for V.A. began. He took an active part in the organization of the mathematics department and in arranging of creative contacts with physicists and engineers in the institute. It must be noted, that intense and friendly relations between representatives of different areas of science had emerged since the beginning in the framework of the institute. The feeling of solidarity and unity of goal harmonized collaborators in general were typical of ILTPE life. This favorable ILTPE atmosphere was mostly due to the director B.I. Verkin, and to the scientific leaders of the institute, in particular, to V.A. Marchenko. At the institute Vladimir Alexandrovich found students and future colleagues (E.Ya. Khruslov, L.A. Pastur and others). New themes appeared in his scientific creation. His works on wave diffraction in periodic structures played an appreciable role in the development of applied aspects of radio-electronics. He discussed with great interest the problems of spectral theory of random disturbance operators with the outstanding Kharkov physicist I.M. Lifshitz, found new approaches to the study of the spectrum of such operators. Research on wave scattering in "dense'' periodic structures brought V.A. to a general formulation of boundary problems in domains with complex structure. In this way a direction was born, named "problems with fine-grain boundary'', and the method for solving similar problems was named homogenization method. Later Vladimir Alexandrovich's attention was naturally drawn to non-linear problems and methods for solving them, which were based on the inverse scattering problem. There he succeeded in carrying his own original ideas to non-linear integrable equations. Besides his scientific work, and at equal rank with it, Vladimir Alexandrovich spent much attention to his family, for the education of his son and daughter, who received a mathematical education as their father. He had many more interests or hobbies, such as ski, kayak, philately which have always been his passions, and remain so till now. Personal contacts with friends, collaborators, colleagues always gave Vladimir Alexandrovich great pleasure, and his constant kindness and respect of others have ensured warm and hearty relations with them. Scientific and public merits of V.A. Marchenko have been rewarded by general recognition, in our state and in the world of science. He is a Lenin Prize and State Prize laureate, and decorated with two orders; in 1961 he became corresponding member of the Academy of Science of Ukraine, and in 1969 full member; he became a member of the Academy of Science of the USSR in 1987. Finally, he received the title of Doctor Honoris Causa of the University Denis Diderot in Paris, 1997, and was elected as a member of Norwegian Royal Society of Science and Literature in 2001.